Relying heavily on his previous effort, 6 Nimmt!, Wolfgang Kramer has transformed it into a more strategic game. The deck is numbered from 1 to 98, with some of the cards having green bullheads and others having red bullheads. In this game greens are positive points and reds are negative points. As in 6 Nimmt!, players are constructing sets of cards, with the fifth card in a set taking the whole thing. This time, however, players take their turns sequentially and can play one to three cards from their hands. In a confusing twist, the Dutch edition of 6 Nimmt! 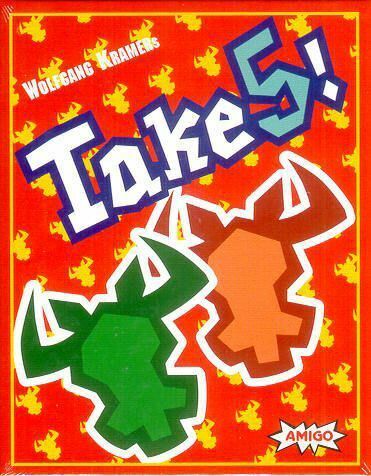 is called Take 5! but is the progenitor game, not this game.